Has my student paid the fee on their booklist? 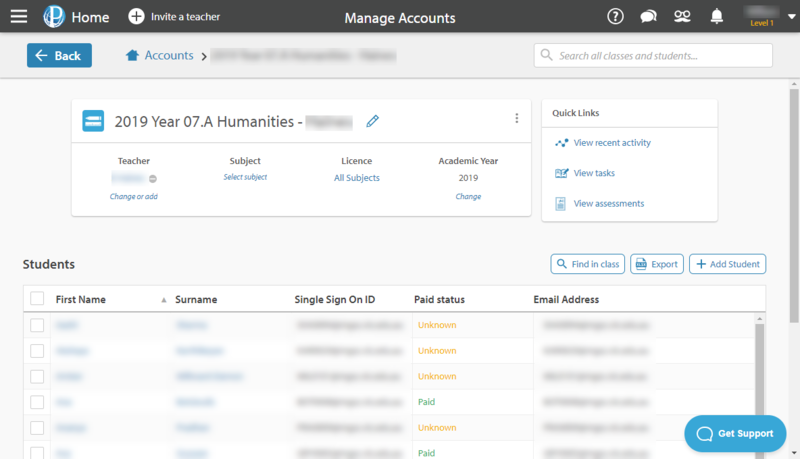 If your school uses a booklister or pays through PayPal, you can investigate which students have paid by selecting the red Manage Accounts tab from your Control Panel. From here, you'll notice that the classes that are assigned to you each have their own tile at the top of the page. If you click this, you'll find a subject-specific Paid Status for each student. Because we have to manually process each payment, there can be a delay of up to 24-hours between a student paying for a subscription and the status on their account changing to paid. You can also select a student's account to see what subjects they've paid for. If your school does not use one of the above booklisting companies or if you feel that there has been a discrepancy between our records and yours, please send the student's name and a receipt to accounts@educationperfect.com.